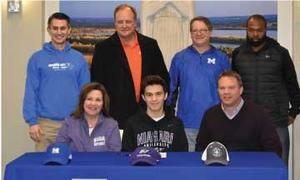 Former coaches, teammates, and family watched on as senior Stephen Hasse signed his Letter of Intent to continue his soccer career as a Niagara University Eagle. The Commons was full of Stephen Hasse's past, present, and future. Former coaches and trainers, former and current teammates, his parents Beth & Rob Hasse, extended family, many Marquette students, and faculty applauded as Stephen signed his Letter of Intent to become a Niagara Eagle next fall. There were many aspects that attracted Stephen to Niagara University. He primarily was looking at east coast schools when he started his college search. Niagara U, located in Lewiston, New York, stood out because it is a Catholic University, has a strong academic program and a Division I soccer team. After meeting the coaches and the current players, Stephen knew it was the right place for him to continue his academic and athletic career. Stephen played soccer for the St. Louis FC and the US Development Academy until his senior year when he decided to join his fellow Explorers and finish out his high school career wearing a royal blue jersey. The team ended their season 14-3-4. He was named Illinois All-State, Chicagoland Soccer 1st Team All-State, St. Louis 1st Team All-Metro, and 1st Team All-Conference. He has also received academic accolades been named an Illinois State Scholar as well as The Rotary Club's Student of the Month. Stephen has been active in multiple clubs taking on leadership roles as the President of NHS and the Vice President of Student Council. He is often seen leading the Blue Crew in a cheer at sporting events and has taken to the court to play volleyball for the BCA 'Volley for a Cure" fundraiser. On Friday, Stephen will shave his head in the St. Baldrick's Foundation fundraiser to raise money for research to help fight childhood cancer. He has currently raised over $1,800. Stephen is excited to continue his soccer career while attending Niagara Univerisity. He feels prepared. "Marquette has been essential to preparing me academically for college. Going to school here has increased my faith and I am happy to continue my education at a Catholic affiliated university." Click here to go to Stephen's St. Baldrick's Foundation donation link. Click here to see the list of student-athletes who have already signed their Letter of Intent.